This week, the Daily Mail newspaper made a complaint to Microsoft regarding their NewsGuard plug-in. 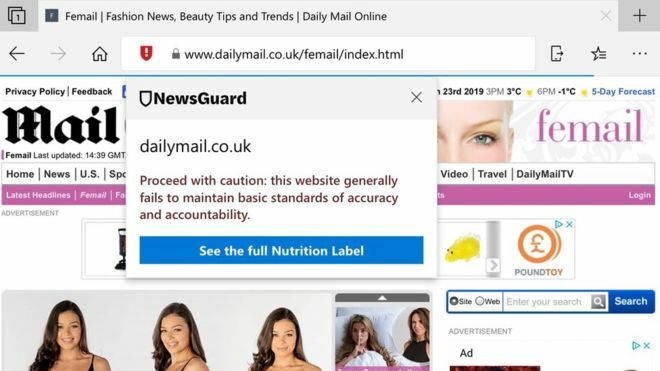 Since August 2018, the plug-in has been warning users of the Microsoft Edge browser who are visiting the Daily Mail website that the site content “generally fails to maintain basic standards of accuracy and accountability”. The matter has become even more of an issue for the Daily Mail since Microsoft launched its browser updates for Android and iOS devices this week, which now have the NewsGuard functionality built in. VakeNews will update its loyal readership as soon as it gets a response from Microsoft and/ or the Daily Mail.